Captain Rick : I am proud to announce 70% completion of my 1999 New Years resolution to walk/bicycle the equivalent of once around the world (25,000 miles) to combat high blood pressure. I hope to reach my goal in 2020. In 1999, at age 52, I was diagnosed with HBP (High Blood Pressure), placing me at an increased risk of heart attack and stroke. My doctor urged me to develop a healthier diet (less fat, cholesterol, salt, sugar) and a daily exercise routine. Captain Rick: I now ride a new 29” Mongoose bicycle. It replaces my previous 26” NEXT, which served me well for 5052 miles along my 25,000 mile “Round-the-World Trek” to battle high blood pressure. It all began as a New Years resolution way back on 1/1/2000, at age 52, to exercise for heart health and help lower the high blood pressure that I was diagnosed with. I started walking several miles a day…every day. 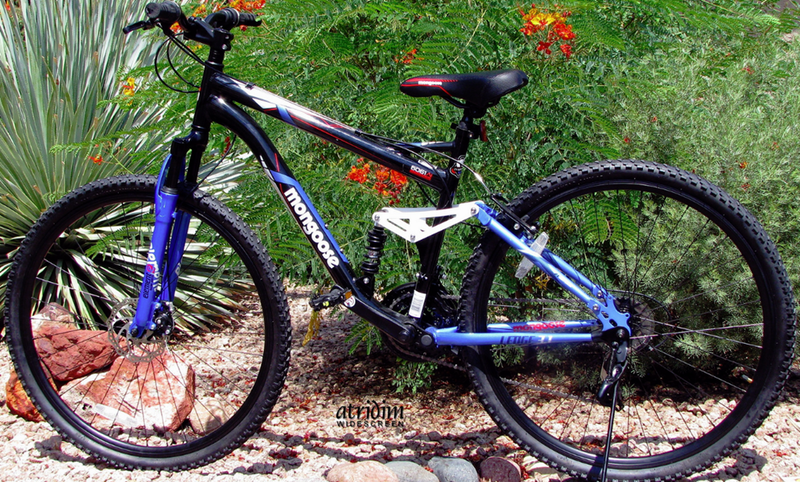 In 2005, I purchased a bicycle to compliment my walking. Somewhere in the process I raised my goal to achieve the equivalent of walking/bicycling once around the world (25,000 miles). 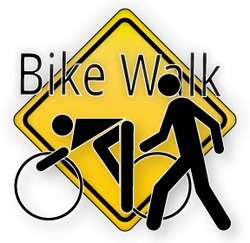 I continue to enjoy a daily 2 mile walk and 3 mile bicycle ride almost every day. I am in the final leg of my journey and hope to reach the finish line sometime in the early 2020s when I am in my mid 70s. My greatest desire is that this blog post will inspire others to make a commitment to exercise for heart health. I am amazed at the difference 3” in wheel diameter makes. Every time its wheels go around , the bike travels nearly a foot farther than a 26”. There is something about the ride that makes it feel like I am riding a big ‘machine’…rather than just a bicycle. Mongoose has done an excellent job producing this great ‘riding machine’. 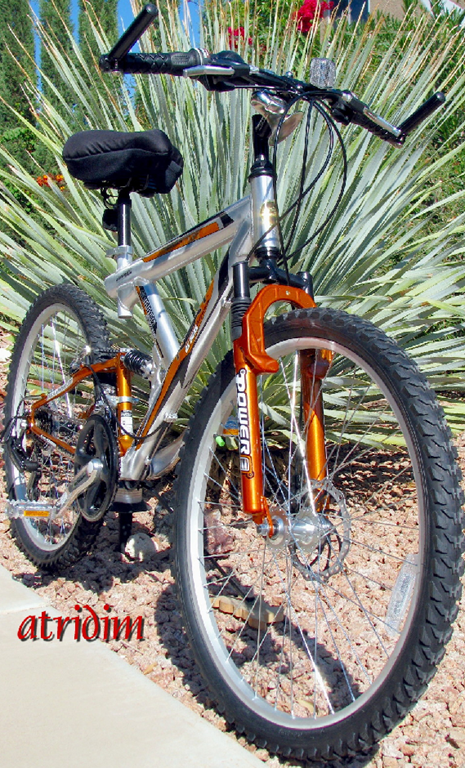 Made by Pacific Cycle, which is owned by Dorel Industries, Mongoose has been around since 1974 and is one of the world’s top bicycle manufacturers. Its line of bikes includes BMX, comfort, hybrid, mountain, and road bikes. Available in specialty bike shops, sporting goods stores, and mass-market stores, the bikes range in price from $300 to $350 for comfort bikes, $280 to $800 for mountain bikes, and $2,700 for its road-bike model. On January 1, 2014, I achieved the 57.4% of my goal (14,282 miles). I am please to report continued good progress during 2014. I will report the new totals on the above page shortly after 1/1/2015. Until then, I will be walking on…and riding a new 29” Mongoose. Captain Rick: What began as a New Years Resolution in 2000 to walk for health, became a 20 year commitment to walk/bicycle the equivalent of once around the world – 25,000 miles (40,000 km). 13 years later, at age 65, I am pleased to share my achievement of passing the half way mark. Since 2000 I have walked 6,630 miles and biked 6446 miles for a total of 13,076 miles. Photos: Me on the left. At center are my old leather Dr. Scholl’s shoes which hold the record for most durable from among dozens that I have worn out over the years. The photo was taken when they had logged 500 miles. On the right is my second NEXT bicycle, when new. It’s a 21-speed with front and rear suspension and a front disk brake. I added a comfortable wide gel seat. Its original tires wore thru in a few hundred miles. I replaced them with Kenda Kross tires with a set of thick-wall tubes and liners to prevent flats. The bike now has 4000 miles logged and still going strong. No flats and enough tread remaining for a few thousand more miles. 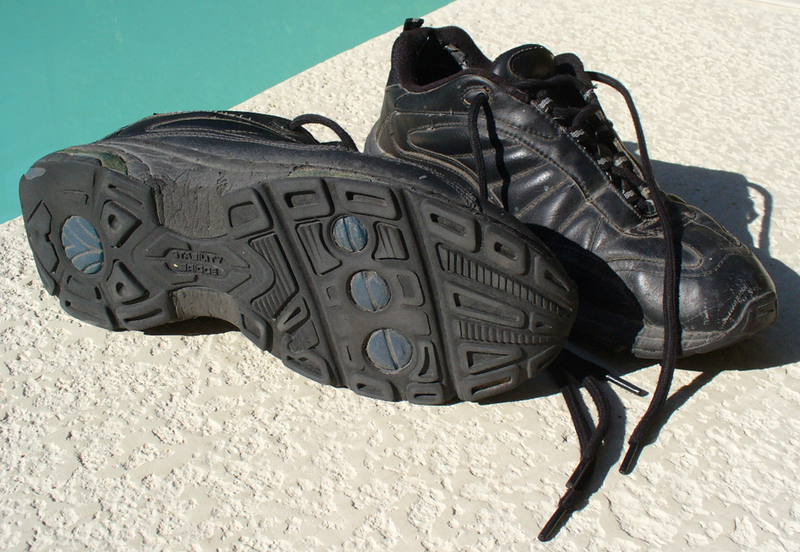 Shoe Tips: I have worn out dozens of shoes since 2000. I have worn many brands from all price ranges. My experience and data shows that the big name brand shoes score among the worst for comfort, durability and cost per mile. The worst pair cost about $100 and lasted only 100 miles before the inner heel area and the sole failed, resulting in whopping $1 cost per mile. Imagine if your car cost that much a mile to drive. On the other end of the spectrum is a pair of Dr. Scholl’s shoes that I bought way back in the early 2000’s. As I recall, I paid about $30 for them. They were one of the most comfortable shoes ever. I walked 500 miles in them, before retiring them as shown in the above photo. They currently hold the record for the most durable shoe. They still have more miles left in them if I get desperate for a good walking shoe. Considering they cost only $30 for serving me well for 500 miles…that relates to a cost of only 6 cents per mile…far less than the expensive name brand shoes. I have been looking for a pair of shoes that can measure up to those old Dr. Scholl’s, but I have had no luck to date. Shoes of that quality are no longer made. Bicycle Tips: As a mechanical engineer, I can tell you that NEXT is one heck of a great bike and its economical. Its sold at most Wal-Marts at a cost of about $200. I don’t know how it fairs against the expensive bikes. I wonder if, like expensive shoes, their high cost is worth the money. So far, my Next has cost me only 5 cents a mile to ride. I wonder if the expensive bikes can claim that? I wonder if any of them would last a 4000 mile ride, as my NEXT has…and remains ready for more riding of perhaps a few thousand more miles. 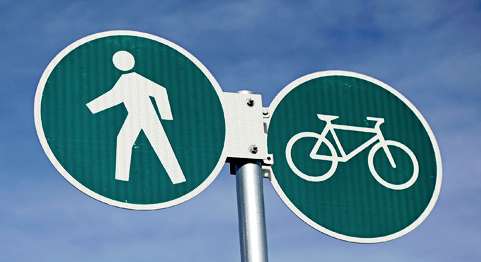 Bottom Line…Challenge yourself: It doesn’t matter if you have the most expensive shoes to walk in or bike to ride on. What matters is that you walk in the shoes you have and/or ride the bike you have…and do it every day. Make a New Years resolution or just a personal commitment to get out there every single day to hit the trail to exercise for your health.